ePublishing Knowledge BaseePublishing Knowledge BaseePublishing Knowledge Base Creating, Managing, and Selling Products What do I do with an order transaction failure notification? You received an order transaction failed notice. Now what? There are a few options, depending on the error and your company's internal policies regarding contacting your customers who failed to complete a purchase. The email includes the customer's order number, contact information, and the order details. Review the reason for the error. 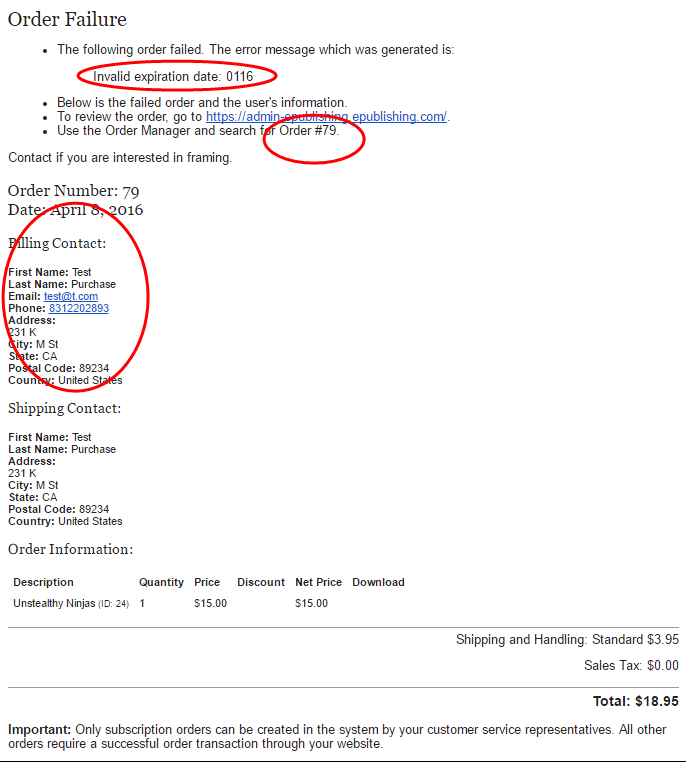 On the above screenshot, the reason the order was rejected by the payment processor (circled) was invalid expiration date: 0116. If the customer successfully submitted a subsequent order with either the correct expiration date or a different card, no further action is required. Look in the Order Manager to see if a successful transaction for the user was processed for this order. Call or email the person directly. Using the information the customer provided on the receipt, contact the customer to see if there is an alternate form of payment or other assistance that can be provided to complete the order. Clearly, the reason for the rejection will guide your customer service team to determine which customers to contact, and which to leave alone. What about flagged fraudulent orders? By default, we do not permit an order to complete if it is flagged as fraudulent. Learn more about how we handle fraudulent orders. If you see a rise in the number of seemingly good orders being failed due to Fraud, you may need to adjust lower for your fraud protection levels with your payment processor. If you see an increase in suspicious orders, you may need to raise your fraud protection levels with your payment processor. This cannot be done on the ePublishing system. Contact your accounting department or the person in your company responsible for processing payments. They'll need to get on the payment processor's website to make any necessary adjustments. TIP: We strongly recommend watching for these notices after you make ANY change to your fraud levels with your payment processor to find the right balance between frustration for your customers and concerns of fraudulent orders. Prev: Can I be notified if an order transaction fails? How? Next: How do I find order transactions that failed?